123Landlord now offers pay-per-use credit & criminal background reporting for any size business. Instantly get identity verification, rental deposit decisions, and fully detailed credit files to assess the potential risk of any tenant or applicant. We've partnered with the nation's leading provider of credit risk assessment and debt recovery solutions to bring you a complete toolkit, integrated directly into 123Landlord. Fast, accurate verification of name and social security number through a national database. Get results with just a couple of clicks. Do you know with certainty if the individual applying for your property will be able to pay the rent on time or even at all? Credit reports through 123Landlord allow you to make accurate, objective, credit-based deposit decisions on your prospective tenants every time. Check the criminal and eviction background of a prospective tenant instantly! 123Landlord uses the most up-to-date national criminal databases to deliver state-wide and county-wide felony and misdemeanor conviction records as well as eviction records. Credit & criminal reports are a completely optional service, charged per transaction and billed separately. An account must be set up via the ONLINE Rental Exchange (for business users) or TransUnion SmartMove (for individuals). 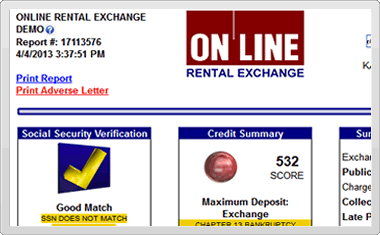 123Landlord integration is available for ONLINE Rental Exchange users. Some businesses or individual may not quality for credit reporting services. Log into your 123Landlord account and visit the Services page for more info or to sign up. Pricing varies per report and number of transactions per reporting period; contact ONLINE Information Services for more information.